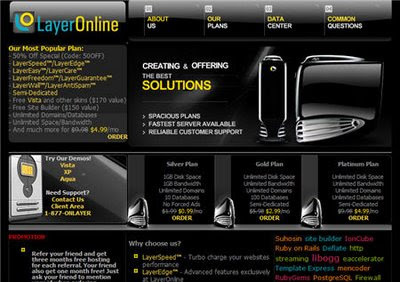 Just searching for some cheap but feature rich and good web hosting I stumbled upon LayerOnline. It is a good host that has a myriad of features to offer. The best thing is they offer cheap web hosting at amazing prices starting at just 0.99/month for 1 GB web space and 1 GB Bandwidth with unlimited domains and 10 databases. The best plan they have is Platinum Plan with unlimited disk space, unlimited bandwidth, unlimited domain and unlimited database. They boast they provide semi-dedicated structure and have a long list of things they imply for their data center. It surprisingly is available at just $4.99/month with Code: 50OFF while registering. A very good “Gold Plan” is also available for just $2.99/month so go grab it. They have used many words with layer and suffix like layerspeed, layeredge, layereasy that have been described in the Common Questions page here. They could have added a “features” page that portrayed all their features in a coherent fashion but never the less the site is flashy but still user friendly. The cart and process are also enticing and the knowledge base seems extensive. They say they provide good support services like search engine submission, first website assistance etc. There are some commercial software free for customers like template expert, Universina. Servers have Apache, PHP 5.2.8, MySQL 5.0.67 Community and Rails 2.2.2 to name some. If you want cheap and feature rich do have a look at LayerOnline.